ARP objects come from the ARP atlas of peculiar galaxies, written in 1966 by Halton Arp. This image shows 2 ARP objects in one field of view in the constellation of Ursa Major. The top object is ARP 214, also known as NGC 3718. It’s a mag. 10.7, 9.2′ x 4.4′ galaxy of the SB(s)a peculiar type (Seyfert 2). It is known as a LINER (Low-Ionization Nuclear Emission-line Region) galaxy, possibly interacting with NGC 3729. The galaxy is classified as a bar spiral, although the bar is an absorption structure and does not consist of stars. The image was taken using a TEC140 with flattener and a QSI583 CCD camera. Although circumstances from my location are far from perfect for galaxy photography because of light pollution the image still shows lots of small and faint objects. In total 185 small galaxies are visible. 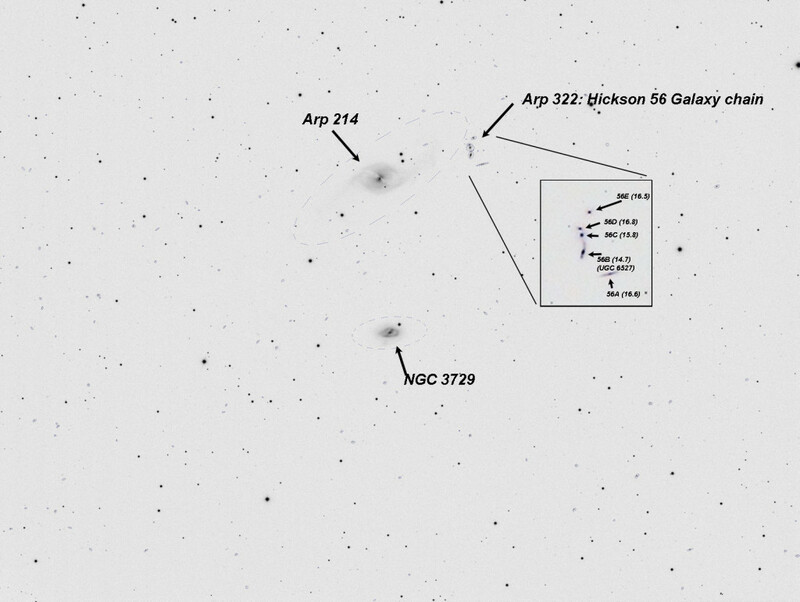 The image below shows an annotated, inverted version showing these galaxies. To the right of ARP 214 another ARP object can be seen, ARP 322, aka Hickson 56 galaxy chain. Another remarkable chain of galaxies, Hickson 56 in Ursa Major, is situated just 7′ south of the barred spiral NGC 3718. This compact group has several catalogue designations including UGC 6527, VV 150, Markarian 176 and Arp 322. 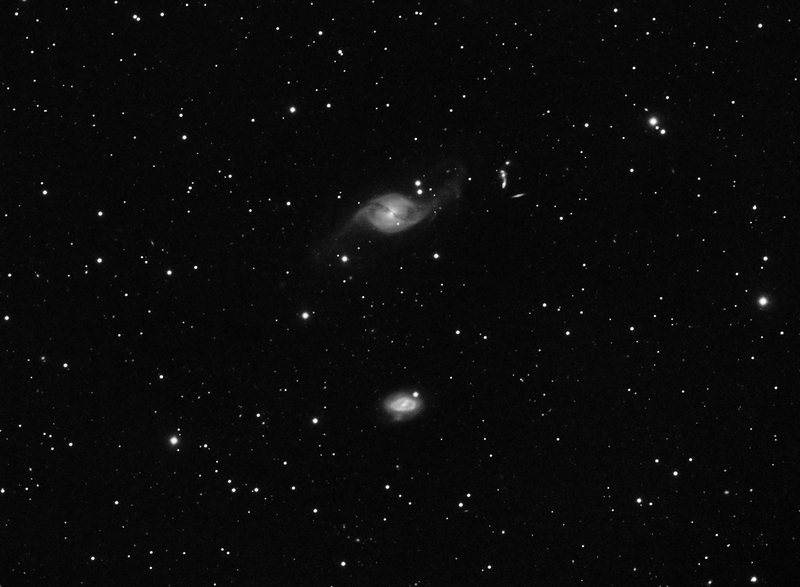 The UGC notes describe Hickson 56 as “a nonlinear chain of 4 galaxies.” These four are connected and cover a length of 90″ = 48kpc. The fifth galaxy is about 65″ from the nearest member of the chain and is possibly at the same distance.” Photographs reveal all five members with the central trio appearing as a linked chain, but visually splitting apart the members will challenge experienced deep-sky aficionados.